We won't be seeing the new Joker movie from Todd Phillips hitting theaters anytime soon, with the film's release date over a year away. Still, thanks to Phillips, we've been getting a good look at what to expect, as the director has been pretty open about the film on social media. 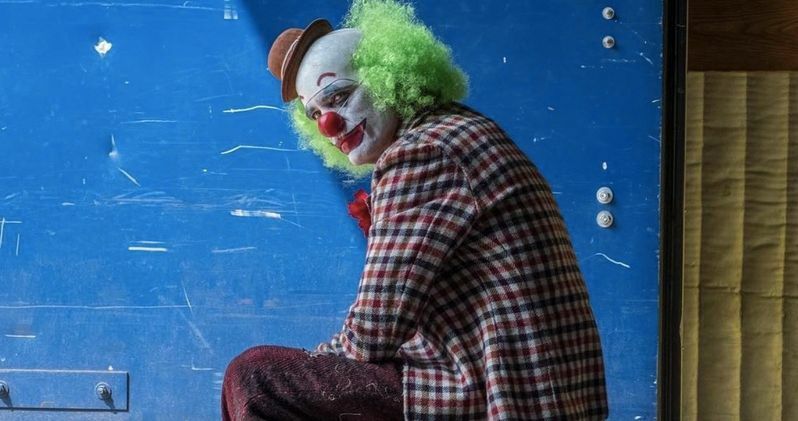 Previously, the director has released sneak peek images and a screen test of Joaquin Phoenix as the Clown Prince of Crime, both in and out of his facepaint. Fans are responding with mixed reactions, but in any case, it's interesting to see what we have to look forward to. Now, Phillips is at it again, releasing another photo of Phoenix in character. While dressed as a clown, however, Phoenix is not wearing the Joker makeup and clothing we've seen in the other photos. This time, he looks like your run-of-the-mill circus clown, complete with curly, bright-green hair. Full details on the plot of the film aren't clear, but the image seems to suggest that the character began as an actual clown before becoming the Clown Prince of Crime. Does something happen at the circus to drive Joker completely mad? While telling us nothing for sure, the photo gives us plenty to speculate about. In other photos from Joker, Phoenix has a much more sinister look. He wears the trademark green hair and purple suit, but has an eerie presence about him. Phoenix's clown makeup has been compared to serial killer John Wayne Gacy, and it seems like this will be a rather dark take on the character. Doing an origin story for a supervillain, especially with the total absence of any superheroes, is a bold move on the part of DC. But if there's only one character to do it with, it's certainly Joker, whose origins have always been shrouded in mystery. As previously reported, the film will have no connection whatsoever to Suicide Squad, which saw Jared Leto take on the part. Still, there are plans in place to produce a Joker & Harley Quinn movie as well, with Leto and Margot Robbie reprising their roles. Tonally, these movies will be worlds apart, but it's interesting to see such different portrayals of Joker on the big screen. As of now, it's unknown if Leto will appear in Matt Reeves' upcoming solo movie about Batman, but Phoenix's Joker won't as the film is set in the DCEU. Joker is going to be very grounded, especially compared to the previous DCEU movies we've seen arrive in recent years. The film will be more of a crime drama than a superhero movie, showing how a failed comedian named Arthur Fleck becomes Batman's archnemesis. Presumably, if the film becomes a hit, it could produce sequels of its own, establishing a new DC timeline. We'll just have to wait and see what ultimately happens when the film is released on Oct. 4, 2019. You can take a look at Todd Phillips' Instagram post of Phoenix in his clown costume below.